SoundVision has been working on a very exciting project with 2K Games, Inc. 2K Games is a global video game developer and distributor. If you are not a gamer yourself, chances are your son, nephew, granddaughter or neighbor own and are fans of 2K’s world famous video games. Located in Novato at the old Hamilton air force hangers, 2K had plenty of room to grow and we were happy to accommodate their unique requirements. One of the hangars was previously used by Disney’s ImageMovers as a motion capture space and we were there to help tweak the facility into a game developer’s paradise. This 134 seat theater was already in place from Disney’s prior use at the hangar, but 2K wanted to be able to utilize the space as more than just an entertainment room. The state of the art theater now doubles as a conference room with theater seating in the back and a U-shaped table near the front to gather for meetings with a discreet pop-up 80″ TV for easier viewing. We built a pop-up lift integrated into a sleek custom built cabinet to fit the conference room TV, that blends perfectly into the background of the theater. The cabinet includes a video conference camera and a soundbar. During meetings the button is pressed and the TV is quietly risen from inside the cabinet for perfect viewing from the conference table. When not in use, the pop up TV disappears into the cabinet giving way to the theater size screen to be seen throughout the 134 seat theater. We used Crestron to automate 4 different lighting scenes. The back A/V room was perfect for our projector and its mount as well as our media rack which can be seen in the slideshow below. For the finishing touches SoundVision gave the original theater room a practical twist. By adding lighting control, a state of the art projector, our automation systems and a pop-up custom made cabinet we were able to convert the theater room into an intimate conference room. We loved getting creative working with the awesome people at 2K Games! We were left somewhat flabbergasted when the VP said that we, the A/V guys have “the coolest job ever!” We always thought making video games was pretty cool, but when we can turn a room into a 134 seat theater/conference room, “the coolest job ever” is not far from the truth! Curved TVs, are they worth it? The newest innovation in TVs is Samsung’s top-of-the-line curved TV. You may have heard about the new curved TVs, but what are they? Is it worth the upgrade? Besides their unique, futuristic look, Samsung suggests the curved screen helps provide a more “immersive” experience. Still, this distinction is quite subtle and seems to have no major influences on the overall viewing experience. Depending on where you are sitting the angle can make distortions more apparent, sometimes skewing the image with a “bowtie” effect. Reflections are somewhat reduced through the curved technology making this TV a possible solution for a room with a lot of light and windows, as the screen will catch less of the reflecting light. Samsung offers these TVs in LED or 4K (4K offers 4x the resolution of high-definition TVs). 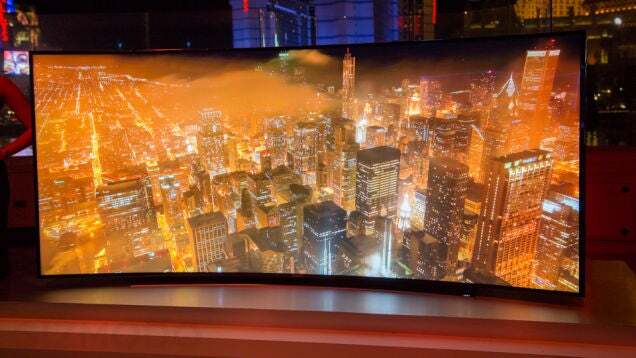 The 65” curved 4K HU9000 is currently offered at $4,500, while the flat LED version remains at $3,800. The TV has excellent picture quality, great design, built-in camera, Smart TV capabilities but the added curve increases the price a substantial amount for little to no added benefit for your family’s viewing pleasure. When comparing the curved screen to the flat screen, the curve seems to be a purely cosmetic option. So is it a realistic upgrade or just a marketing gimmick? For now we say gimmick; you’re better off putting your money towards a bigger, yet equally beautiful flat-screen model. Unless you prefer the cosmetic aspect of the curve and don’t mind paying a premium, by all means go for it. If you truly desire something no one else has, you can upgrade to an 105-inch curved UHD TV for nothing short of $120,000! Gimmick or Realistic? You decide. Come check out the 4K projector in our showroom if you haven’t had the chance to experience it! Home Theaters are our specialty here at SoundVision. . We are ready to help bring the cinema viewing experience into your home. Whether the project is big or small, we can help construct the viewing space ideal for your home theater. Going big? No home theater is complete without the correct lighting, a big screen and the perfect viewing chair! Seating is a crucial aspect of your personal cinema and can completely change the ambiance, making it a movie night your guests will never forget. Cineak Seating is known for their elegant design and dual functionality. The seating is completely customizable ensuring your home theater is one of a kind and completely tailored to the décor and style of your theater. Check out the endless design possibilities on Cineak’s official website. All of their fine seating includes the highest quality leathers and fabrics. No matter the size or shape of the room your luxurious seating can be configured to your exact needs. Your new seating arrangement can be fully automated and integrated into your control system for the complete seamless experience. The end result is a luxurious home theater provided by the ease and convenience of your automation system, replicated nowhere else in the world.